(Bloomberg) -- Amazon.com Inc.’s biggest bull hasn’t given up on the idea of the e-commerce company opening a second headquarters in the Big Apple. “We remain unconvinced that it has officially closed the door on New York City for one of its second headquarters locations,” wrote D.A. Davidson analyst Tom Forte, who has a buy rating on Amazon, along with a $2,450 price target that represents the highest view on the Street. Amazon is taking “logical steps to combat this risk including raising its minimum wage to $15 and its HQ2 searches, expanding its presence in other major metropolitan areas,” Forte wrote to clients. 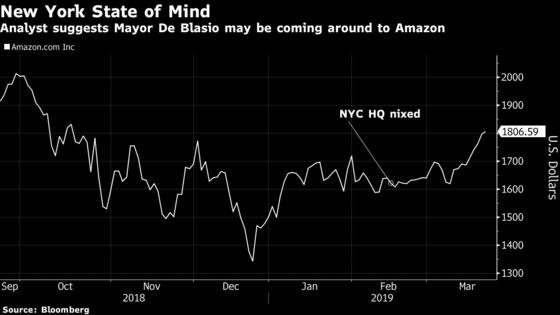 In February, Amazon said it wasn’t going forward with a previously announced plan to open a headquarters in Long Island City, Queens. The move followed opposition to the benefits package offered to the company, including close to $3 billion in tax breaks and subsidies. Following the announcement, Forte wrote that Amazon “may be bluffing” about shutting the door on New York City, suggesting it could simply have been using the announcement “as a means to get the government back to the table.” A major New York City location, he wrote, makes “geographic sense” for Amazon given it is expanding its efforts in advertising and media. Shares of Amazon rose less than 1 percent on Thursday.